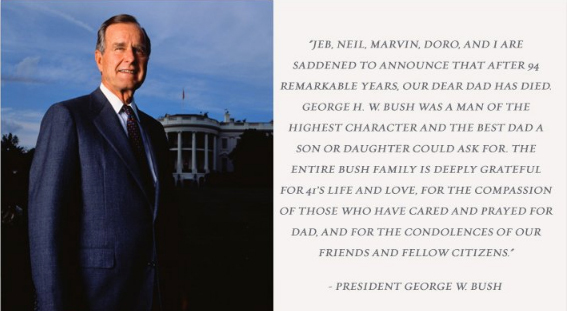 “George H.W. 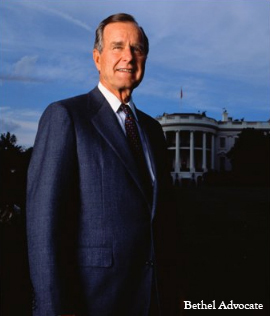 Bush, the 41st president of the United States and the father of the 43rd, was a steadfast force on the international stage for decades, from his stint as an envoy to Beijing to his eight years as vice president and his one term as commander in chief from 1989 to 1993. “The last veteran of World War II to serve as president, he was a consummate public servant and a statesman who helped guide the nation and the world out of a four-decade Cold War that had carried the threat of nuclear annihilation. —Above according to the Washington Post. View life story here.